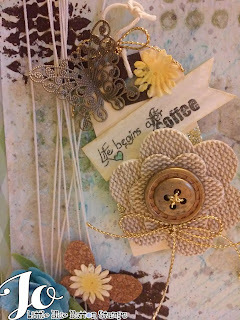 ~Jo's Scrap Shack~: September New Release with Little Blue Button Stamps! 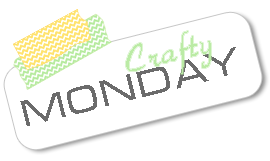 September New Release with Little Blue Button Stamps! This is my 2nd Post today! Scroll down to see my first post! Ok so can anyone else believe how fast summer has flown by? We have like a week left here in the Northeast. But I am ready for the fall and everything that I love that associates with it. The bonfires, cool crisp air, hot cocoa and hot apple cider and of course, the changing of the leaves. But for now, will you settle on some hot coffee or tea? September's new release has a little bit of something for everyone. The Little Blue Button Stamps Shop has released some amazing digital stamps for this new release and I am super excited to share with you what I created. 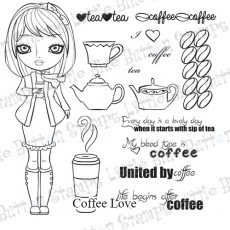 I had so much fun working with the digital stamp called, Coffee Love. From the Coffee love digital set, I used the "Life begins after coffee" sentiment, the cute girl image and the large coffee cup. I printed the images off onto some GP cardstock and colored them in using copic markers. 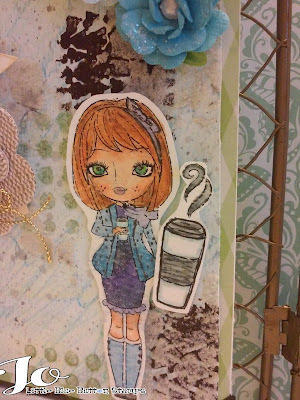 I added some sparkle to her headband, outfit, & large coffee cup using my Spectrum Noir clear sparkle pen.I fussy cut the images out once done and set them aside. Next I took a few embellishments to create a nice large cluster. So I started off with a small manilla tag and inked around the edges with some old photo distress ink. To the top of the tag, I added a burlap flower that I had added a vintage button to its center and tied some gold cording through it, finishing it off with a bow. Above the flower, I added the sentiment from the new Coffee Love set and inked up the edges and created a banner tail to one end. And above the sentiment, I chose to add a metal copper butterfly that I had in my stash. Because this was a much larger card than what I usually do (6x6), I still feel like i needed to do more. So I took some light thread that I had and wrapped it around the left side of the panel eight times for more texture. I then added a cork butterfly with a small flower to one of the strings. To finish off this card, I added two small floral arrangements in two of the corners and added a few of the little yellow flowers that I had used on the cork butterfly. You may not be able to see it, but the green dots on the background, are sparkling as I used glitter paint with that. So the background is sparkling. I adhered this finished front layer to a piece of patterned paper from a MFT 6x6 paper pad and then adhered the entire layer to a white 6x6 card base. And lastly, I added some black corners to the card. Well I hope you enjoyed my mixed media card showing off this awesome Coffee Love image! Please remember to head on over to the LBBS Blog to check out the awesome projects that my design team sisters have created for you using September's New Release. This is beautiful JO - I love FALL but I am not that fond of Winter - the COLD weather - like me some Mocha! Enjoy your day! 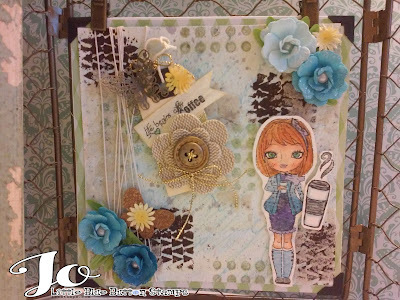 Love all the layers you created and the pretty flowers and butterfly. Of course, the image is adorable! Love your card! Jo my sweet and super talented friend !! I have missed you !!! I adore this card you created ! It is lovely !! Super cute image ! WOW! This is really Beautiful my friend! !I love the butterfly embellishment.. It's Gorgeous! The coffee love image is adorable!! You did a great job on coloring those adorable images.I love the pretty flowers too!I am a huge fan of coffee so I absolutely LOVE this my friend!! You are AWESOME!! This is stunning, like all your details, your layers and embellishments are perfect! 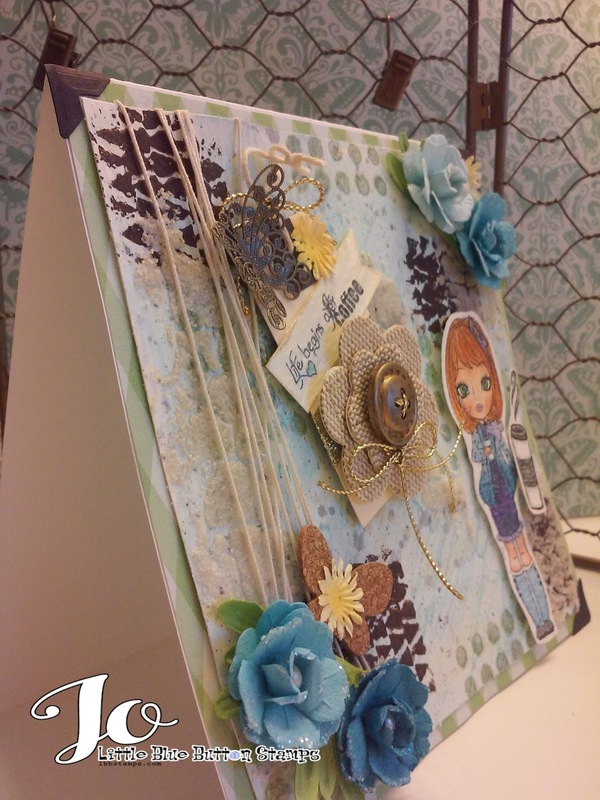 Beautiful card and love all the fabulous layers! WOW, all the embellishments and flowers look amazing! 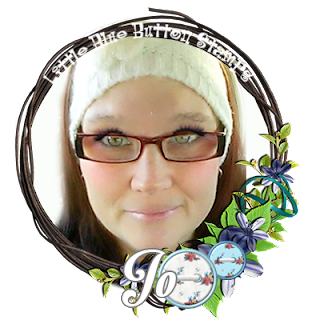 I LOVE the theme:) Fantastic details Jo!